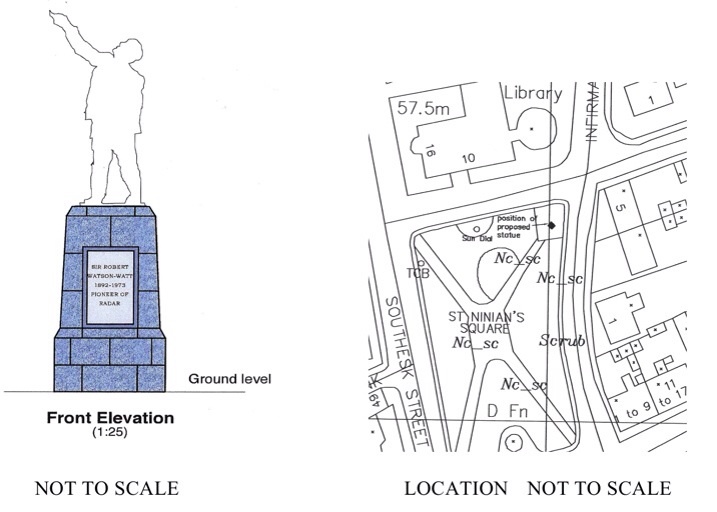 The various works associated with the memorial to Sir Robert Watson Watt have commenced on Monday the 24th of March. The site works, storage and site facilities will be confined to the surrounding grass and pavement areas within the square and apart from offloading of materials etc. should, it is hoped, cause as little disruption to adjacent properties as possible. The works, comprising of excavation, and foundations, followed by the erection of the base and plinth and subsequently the installation of the bronze statue, will be followed by the reinstatement of the paving and repairs to the grassed areas. It is anticipated that the works will be completed within 5 weeks, however, the official unveiling may not take place until July owing to previous commitments of the parties involved. Any complaints regarding lack of access, inconvenience form the works, etc should in the first instance be directed to the Contactors on site representative or alternatively to the writer of this information notice.